The need for limitless storage space, high availability, low latency and scalable infrastructures has increased the number of available cloud services for file storage. Data backup, synchronization of files, redundancy and cross platform support are some reasons for using cloud services. The Tasks related to cloud automation includes sync options like Upload files and Download files. You are also able to List files, Delete files and Create folders. When downloading files you are using the Cloud file explorer which lets you, in detail, specify folder, file mask, filter on date and size parameters. Also, a test functionality is available so you can see which files that will be found according to your filter definition. 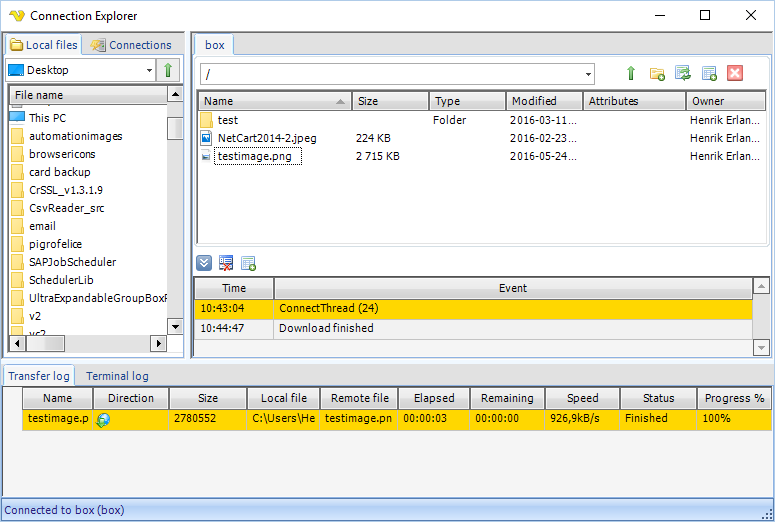 The Connection Explorer is found under the VisualCron Server tab -> Tools menu. For all cloud services you can use any existing Connection and navigate through files and folders. VisualCron uses the Cloud file Trigger which can monitor a folder in a remote cloud service. When a file has been created, updated or deleted the Trigger will fire (depending on the settings). Optionally, a created file can be downloaded to a local folder.